Both news readers in this programme claimed that the purpose of the Government’s ban on new oﬀshore exploration for oil and gas was to cut New Zealand’s greenhouse emissions and was necessary because New Zealand signed up to the Paris Climate Agreement. The ban will not cut New Zealand’s emissions. Hydrocarbon exploration does not generate greenhouse gas emissions (any more than most industries). In the medium term there will be no change. In the long term, transporting imports of oil and LNG will create more emissions than local extraction. The Business New Zealand Energy Council is quoted by the Herald: “There will be no overall reduction in global emissions and potentially an increase in emissions as a result of this ban as global exploration from places with lower environmental standards fills the gap left by our reduced output.” This is undoubtedly true. There is nothing in the Paris Climate Agreement that could require New Zealand or any other country to cease exploration for oil and gas. No other developed country has done so, with the sole exception of France (which has no real prospects anyway). It seems the Prime Minister is determined to create a second “nuclear moment”, to grab the world’s attention (before CHOGM). The reason for the ban given by Prime Minister Ardern was not to cut emissions but that the transition to a zero-carbon economy “must start somewhere” and she wanted to avoid future “abrupt shocks to communities” (Herald). The overall eﬀect of the story presented by One News was that the Government ban was Paris Agreement and was uncontroversial except that the oil industry said it would cost thousands of jobs. That is a highly distorted version of the day’s events and reactions. The Opposition leader called the decision a “wrecking ball” and vowed to reverse it if the National Party is returned to power in 2020. That creates great uncertainty amongst both international investors and aﬀected communities. There was no prior consultation with the industry and the decision runs counter to the government’s pre-election platform. An industry spokesman said it showed the government had “a fundamental misunderstanding of the industry.” The ban came as a total surprise to not only the Opposition, but to both the gas industry and the Taranaki region. As a Herald reporter comments: “What is lamentable is the apparent level of consultation.” The ban takes eﬀect immediately and is not subject to select committee or other deliberation. Many billions of dollars of future Government royalties are sacrificed by the ban. Royalties of about $500 million per year are received currently and this figure could expand exponentially if a major hydrocarbon field were to be discovered. The gap will have to be made up by taxes. Most North Island heavy industry relies upon long-term gas supplies, and the Marsden Point oil refinery back-loads condensate. The ban also aﬀects the electricity industry which will increasingly rely upon gas for both dry years and back-up to intermittent wind supplies. None of these major controversies were explored or even mentioned by One News. The audience was led to believe that this was a routine environmental decision which was driven by the Paris Agreement, and aﬀected almost nobody outside of Taranaki. The programme seriously breaches Standards 8 and 9 of the Broadcasting Standards. Clearly we cannot stop overnight. Hence a transition period. Not issuing new permits for exploration is just the start. Greenhouse gas emissions have gone up when we pledged to reduce them. We need to reduce them to avoid disruptive climate change, if possible. What we are doing now is too little too late. But it does send a signal: Science has won. Burning fossil fuels is causing global warming. They must be, but not all of it (the IPCC agrees), so how much? They say about half, BUT IT’S A GUESS! So I’m asking for evidence, because science always wins. Science tells me that if I blow on my bowl of hot soup, the more air over it will COOL the soup. Science tells me that if I turn my fan on, up a notch, the more air over me wiil COOL me faster. Science tells me that if I stand out in the wind on a cold day, I’ll suffer from wind CHILL. The atmosphere (air) COOLS the Earth’s surface. What part of the word, COOL, do you not understand, Stephanie? Human activity is causing global warming. How much? More than all of it. Because Earth was cooling for several thousand years before the Industrial Revolution. The anthropogenic attribution of the observed warming is almost certainly more than 50%, i.e. the probability is greater than 95% that this statement is true. 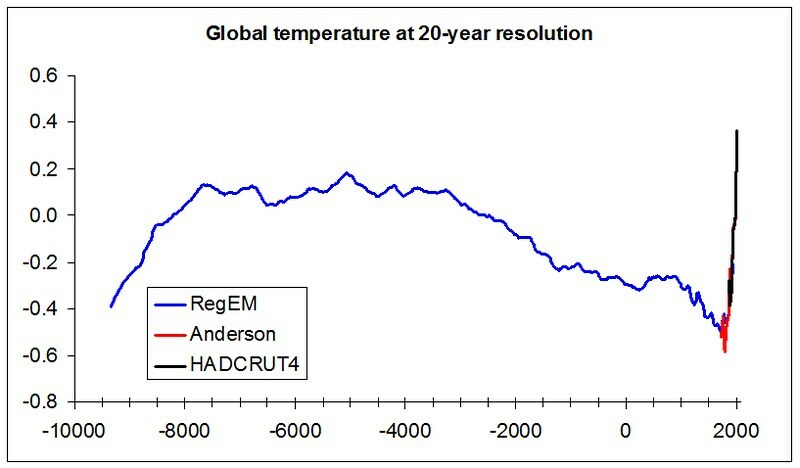 The anthropogenic attribution is likely to be at least 100% of the observed warming. At least try to substantiate your disagreement. Bold type alone doesn’t really move us. More than all of it. Because Earth was cooling for several thousand years before the Industrial Revolution. That doesn’t follow either. Are you saying our emissions got us out of the Little Ice age? Are you sure you want us to take you seriously? I’m too busy to read your long references, so it’s a waste of time sending them. If you want to help, please choose more easily assimilable chunks or write them in your own words. Wikipedia references to climate change cannot be trusted. Heard of William Connolley? He’s a serial vandal of balanced articles on global warming, turning them into warmster memes, eventually chucked out as an editor by Wikipedia. The Conversation piece is by the EPA. You cannot seriously expect us to accept anything they say about global warming, when they’ve been in the hands of activists for years. Maybe new work, but certainly not this from the archives, clearly marked as not maintained and may not apply. Richard Treadgold. If you can’t be bothered reading evidence perhaps you have time to look at a picture. Gases in the atmosphere are warmed by conduction/convection, latent heat from evaporation, and radiation from the surface and from the Sun. However, the atmosphere can only lose this energy by emitting it to space. Carbon dioxide is a better emitter of energy than nitrogen and oxygen (the main gases of the atmosphere). If the capacity of the atmosphere to emit energy to space is increased will that have a warming or cooling effect? Your picture is a sort of hockey-stick a-la Michael Mann. …even the medieval warm period ironed out….great stuff….lies and damn statistics…you know…one small lie for Mann, one giant fraud for mankind…..And all that ice during the ice-age.. ie the melting of ?….some of you loons even attribute that to building up of CO2 and “greenhouse gases” in the atmosphere. Yeah, it was the CO2 from volcanoes, bugs and snow-mobiles that melted all the ice. There are even loons among you who can trace the blame for “climate change” back to the cave-man….he started effing up the atmosphere as soon as he rubbed two sticks together. Sorry , NO input from….you, me, uncle Tom Cobbly, and all. The good news is: Bahrain has found two new fossil fuel reserves. The oil and gas under the Kiwi ocean will not be needed until New Zealand’s population reaches 100 million, which will take about twenty years under present geopolitical circumstances. If the subsidies for renewables are pulled by the western democracies, some real competition will hopefully introduce greater efficiency. Anyone who believes in AGW and also believes it to be bad for planet earth may start living very frugally right now. The Economist today reports that the Brent oil price has moved up to $72/barrel and notes sardonically that New Zealand has decided to stop looking. Petroleum products are our #1 import ($$) and diesel spend jumped 41% in 2017. Diesel is, of course, what powers our fishing, farming, horticulture and tourism industries, and keeps us all in jobs. Stephanie, you refer to “a transition period”. That won’t start for another 30 years and will need to be addressed by your grandchildren’s generation. New Zealand is one of 29 members of the International Energy Agency and our Government relies heavily upon its reports. The IEA’s World Energy Report 2017 predicts that oil will maintain a steady UPWARD trajectory to 2040 when it will hit 105 billion barrels/day. Gas is expected to increase by 45% by 2040. A trial date of Oct. 29 has been set for a landmark climate change lawsuit brought by a group of young Americans despite the Trump administration’s efforts to halt the case. The lawsuit was originally filed against President Obama’s government before President Trump took office. Incidentally, just days before the case was turned over to the Trump administration, Obama’s Justice Department lawyers admitted many of the young plaintiff’s scientific claims were true, including carbon dioxide (CO2) concentrations have increased to greater than 400 parts per million. Additionally, the federal defendants admitted that fossil fuel extraction, development and consumption produce CO2 emissions and that past emissions of CO2 from such activities have increased the atmospheric concentration of CO2. U.S. Magistrate Judge Thomas Coffin set the trial date for this Fall despite Trump’s DOJ attorneys saying the date “won’t work” for the defendants. The problem of anthropogenic global warming and climate change has moved past the science. Renewables are displacing fossil fuels. Homo sapiens better get a move on. Time is running out. Nothing wrong with that, as long as they teach the science. But to call it a rebuke to the Heartland Institute is ridiculous (I don’t know which states you’re referring to). What do you base that on? Heartland have an impressively comprehensive programme on education. They practice science, so I’m confident they’ll want our children to be taught science. Not really, or only a tiny amount. In 2016 global oil use was about 12.5 million tonnes per day, while biofuels provided about 0.2 million tonnes per day (of oil equivalent). Over the last ten years, biofuel production increased from 0.07 mT/day to 0.22 mT/day, a rate of about 0.02 mT/day/yr. Forecasts expect it to rise by about 3.6%/yr over the next ten years. By 2040 oil production is forecast to be 14.4 million tonnes per day, an increase of about 0.9 mT/day/yr. The bottom line is that demand for biofuels will not approach any significant fraction of the demand for oil in at least the next 20 years and probably 40 years or more. If you believe that renewables are displacing fossil fuels you’re in a dream. Sources: The Freedonia Group (a leading international business research company); the FAO; BP Statistical Review of World Energy June 2017. China is the world’s leading country in electricity production from renewable energy sources, with over double the generation of the second-ranking country, the United States. In 2013 the country had a total capacity of 378 GW of renewable power, mainly from hydroelectric and wind power. China’s renewable energy sector is growing faster than its fossil fuels and nuclear power capacity. Although China currently has the world’s largest installed capacity of hydro, solar and wind power, its energy needs are so large that in 2015 renewable sources provided just a little over 24% of its electricity generation, with most of the remainder provided by coal power plants. Nevertheless, the share of renewable sources in the energy mix had been gradually rising in recent years. China sees renewables as a source of energy security and not just only to reduce carbon emission. China’s Action Plan for the Prevention and Control of Air Pollution issued by China’s State Council in September 2013, illustrates the government’s desire to increase the share of renewables in China’s energy mix. Unlike oil, coal and gas, the supplies of which are finite and subject to geopolitical tensions, renewable energy systems can be built and used wherever there is sufficient water, wind, and sun. As Chinese renewable manufacturing has grown, the costs of renewable energy technologies have dropped dramatically. Innovation has helped, but the main driver of reduced costs has been market expansion. In 2015 China became the world’s largest producer of photovoltaic power, with 43 GW of total installed capacity. From 2005 to 2014, production of solar cells in China has expanded 100-fold. The science is settled. We need to act. Simon Bridges is a gasbag. Chapter 5 The Sceptic. Professor John Christy, Southern Baptist pastor. Sure thing, Stephanie,..it’s a piece of crap science….even proven experimentally to be crap… by Woods at the turn of the last century. Basically the intellectual loons concoct some magical bit of ONE WAY insulation surrounding the Earth. A magical “blanket”. …which can magically selectively split wavelengths of radiative energy. Of course…WHERE EXACTLY is this “blanket” ,Stephanie? Richard Treadgold. You might do your followers a favour and give them a brief lesson in the simple physics. They might listen to you. Fancy not understanding the greenhouse effect; how CO2 works as a greenhouse gas. Sorry, it’s too late. You haven’t responded to my references and, in a sin even more profound, you haven’t responded to my comments. You have revealed yourself as a troll, an agent provocateur, uninterested in civilised debate, intent only on stirring up trouble, unworthy of a civilised response. Bye. Good riddance. She lost patience, or her last marble. Game over, Stephanie. Yes. But I haven’t banned her, Jacob, she can still post comments here, and anyone can answer. It’s just that I won’t bother any more. Stephanie has a very good point. You need to teach your audience how the greenhouse effect works as there are some clear misconceptions present. Maybe you could do so in your own words and without using references as people are apparently too busy to read them. NBR ($$) quotes John Kidd of boutique broker Woodward Partners explaining the effect of the government’s bombshell decision on energy investors. The ban might well be unlawful as the Crown Minerals Act requires the government to “promote prospecting for, exploration for and mining of Crown Minerals for the benefit of New Zealand”. He says the move “must be symbolic” as it will deliver a rise in global emissions. No account has been taken of ‘carbon leakage’. In fact, no cost-benefit study of any kind seems to have been done. Everybody has long recognised that emissions are a side-effect of demand – not supply – so it is difficult to see any quantifiable benefit. “The decision will increase the risk to New Zealand’s energy independence and security, worsen its balance of payments, lower its tax base and disadvantage regional economies – and that only accounts for the existing producing Taranaki region. Energy Minister Megan Woods saying “we don’t export our gas” – when New Zealand does in fact export gas as methanol and generates export receipts of more than $1 billion a year from doing so – “indicates a fundamental lack of understanding of the sector, its flows and its value drivers”. In taking this step, New Zealand joins Belize, Costa Rica and France as the only countries to have implemented a ban of future new exploration. New Zealand is the only one of these that has a material indigenous oil and gas sector. It is also the only island nation, meaning it does not have cross-border imports to support its energy security. France, for example, imports Norwegian oil and gas and is the world’s largest exporter of electricity. Unlike New Zealand, it could indulge in virtue signalling at no real cost. @Simon. I have worked in greenhouses. The effect can be studied by anyone who has ever had a bit of sunlight shone on him or her. Universally, everything is always in balance. Whatever happens, the universe, which includes everything, that’s why it’s called the universe, The Universe, is always in equilibrium. Matter and energy are all one and interchangeable as and when it happens. That means, the universe keeps everything in equilibrium always, every Planck moment. Since dark matter and dark energy are everywhere, the exchange between dark matter and dark energy and manifested matter and manifest energy happens within the Earth environs as well as without. Energy-wise, the earth and its atmosphere are not isolated from the rest of the universe. So there, no greenhouse effect globally. Better to worry about the environment. As I said, they are stooges, enforcers, stand-over merchants, working for the nascent global dictatorship. Stephanie has a very good point. Really? She makes about as much of a point as you do. I see no reason to heed your advice. In fact, since you’re the ones who raised the subject of dangerous anthropogenic global warming and want us to believe you, and not the other way around, please feel free to explain what we should be worried about and why. “We have had a very challenging time,” said Guy Smith, vice president of the National Farmers’ Union (NFU). “March breezed in with the ‘beast from the east’ and went out with the worst bank holiday on record.” For asparagus-lovers there is at least an upside. “The combination has to be right for the crowns to push through,” explained Per Hogberg, of grower Wealmoor. “The air temperature has to be at least 12C, while the soil temperature should be between 8C and 10C. With warmer weather expected, consumers can expect a bumper crop in mid-May,” he said. What the farmers are experiencing first-hand accords with what scientists are finding. Ed Hawkins, professor of climate science at NCAS-Climate, University of Reading, who helps run http://www.WeatherRescue.org – a site where volunteers digitise millions of historical weather observations – says that UK temperatures have risen by around 1.5 degrees in the last 150 years. In the short term, farmers like Smith hope that the coming week’s warmer, drier conditions are going to stretch through April. In the longer term, he believes that the first three months of 2018 should sound alarm bells. “We need to remember that it’s reckless to take food production for granted,” he said. For consumers: the proof of the pudding is in the eating. Or not. Wind farms set new records for half hourly, daily, weekly, monthly and quarterly generation in the first three months of this year. NZ needs to reduce GHG emissions immediately. One problem is electricity is already mostly from renewables. Land use is problematic, but the technology exists to change the transport sector. The other problem is ignorance and stupidity. National lied for nine years. And continue to lie. Universally, everything is always in balance. Jump off the roof then. Someone I know works as a diver as well as diesel mechanic, welder, etc. He’s worked on these windmills off the Irish coast somewhere. Some day, these windmills might pay, but not yet. The carbon footprint of offshore windmills is horrendous. They never tell us the true cost. Maybe something that floats will pay, but concrete is very carbon/fossil fuel intensive. Then, anywhere near salt water, these turbines don’t last long, and they need a lot of maintenance. Fancy flying a diver/mechanic from Holland out to Ireland for a day’s work. Travel time, travel, accommodation, tools and spares to be organised and shipped with the maintenance crew out from Cobh or somewhere there. Perhaps the Right Royal Societies would like to calculate and publish the correct figures, leaving nothing out, of course-It has to be scientific. Scientific American versus “someone I know”. NZ total installed capacity all generators about 10 GW. Stephanie, please, stop this nonsense or push off. It takes 30% of fossil fuel use to produce 15% of renewable energy. You are simply being a pest. There must be something better you can do with your time and talent. Bye, bye! As a farmer myself, the risk of warmer weather is not a risk, more a benefit. The risks of later spring frosts and earlier autumn frosts is anathema to any farmer. So to fix your simplistic equation, “For farming: global cooling = bad, global warming = good. For consumers: more food = good.” There, fixed. Don’t bother writing simple science for your followers. Stephanie, I was glad when RT didnt ban you, I do like to READ both sides of the argument. So please lay off the insults, its what people do when they have lost the argument.